John N. Loughborough | My Gospel Workers | "Redeeming the Time"
J. N. Loughborough became a Sabbath-keeping Adventist through the labors of J. N. Andrews. He began preaching immediately and was ordained in 1854. 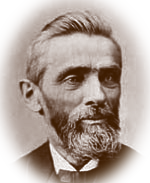 He, along with D. T. Bordeau, were our first missionaries, sent to California in 1868. In 1878, he was sent to Europe. He was at one time president of the Illinois Conference. He was the denomination’s first historian, and wrote the books, The Rise and Progress of Seventh-day Adventists and The Great Second Advent Movement. Like most of the early Advent leaders, Loughborough took a real interest in the literature work. He and James White discussed ways and means of advancing the work of the gospel. It was suggested that if books were offered to the public in connection with preaching services, the people would be willing to pay a small price for them. Thus, the way would be prepared for more literature to be produced. Young Loughborough tried this method, and it was a success. Loughborough was truly a great pioneer, lending his many talents to the development of the work wherever there was a need. Elder Loughborough was obedient to the heavenly vision, and God used him in a mighty way to build up the interest of His cause. Loughborough spent his last years in the St. Helena Sanitarium, where he passed away peacefully on April 7, 1924, at the ripe old age of ninety-two.